Meet LatchepenLondon-based gipsy jazz band consisting of four brilliant musicians (three of them being conservatory graduates). Full of passion for Django Reinhardt and 30s swing, their debut album Love Letters translates into a contemporary reflection of the era that saw jazz hit heights in popularity never to be seen afterwards, even though the particular type of jazz articulated by Latchepen never came to be a mainstream attraction during the time. Gipsy jazz has always seemed an extremely exotic variable in jazz history, since its origins lie outside the United States, i.e. France. Because of its French origins, gipsy jazz tends to be very melodic, extremely flamboyant, and harmonically saturated. It can also sound extremely romantic when performed in a chamber-type setting. This, of course, is an oversimplification of this peculiar niche sub-genre in jazz history. Yet, judgment values should be established, even though most of them (if not all) are very arbitrary, especially when addressing jazz. The amount of flamboyance exhibited on Latchepin proves is crucial to the encapsulation of an authentic mood found in gipsy jazz. The rest, however, is a mixed-bag that falls into the typical debut album syndrome in jazz, where a band tries to show its versatility by sacrificing the content's coherence or its conceptual unity. The album features both jazz standards and original compositions that are too far apart. It's not that one of the disparate parts is better than the other. Both are full of romanticism and nostalgia, although some of the band's original compositions sound even more exotic than most gipsy jazz, evoking the mood of Balkan and Mediterranean regions, which are both geographically and culturally situated further away from the gipsy jazz country of originsFrance. It's not that one (standards or originals) sounds less gipsy than the other. Holborn's violin intonation is remincent of a self-taught travelling musician rather than a conservatory graduate, which significantly enhances the atmosphere for the better in terms of the sub-genre's authenticity. Yet, it doesn't seem to be coherent both conceptually and in terms of overall musical dynamics. As a result, it is difficult to evaluate Love Letters as an organic unit, which an album should be. 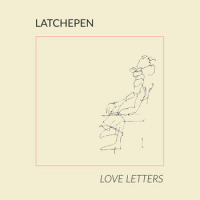 It doesn't, however, diminish the potential Latchepen retains throughout their debut release. If only one direction (either original compositions or standards from The Great American Songbook) was chosen, it might have worked better, and carried more excitement. The foundation is there; hopefully a second album by the band will carry a more linear approach. Track Listing: Love Letters; Second Avenue; Chandra; I'll Be Seeing You; Thunkette; I Guess I'll Hang My Tears Out To Dry; Captain Summer; Whisper Not; Koo Koo; Our Laughing Heart.